LTHForum.com - Does "Good" Frozen Pizza Exist? Does "Good" Frozen Pizza Exist? LTH Home > Chat > Shopping & Cooking > Does "Good" Frozen Pizza Exist? 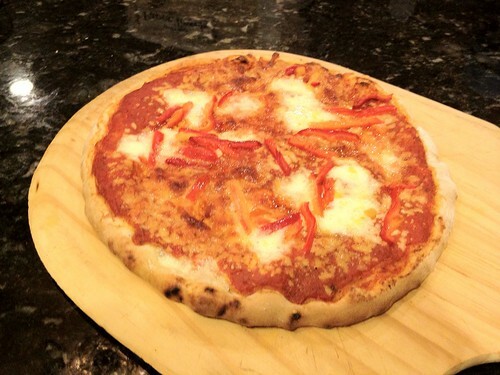 Organic wood-fired Sicilian-style pizza (imported) from Trader Joe's = good frozen pizza. You may need to redistribute the roasted red pepper pieces and apply the included surprisingly-nice olive oil, but it actually tastes like real bread, cheese, tomato, and vegetables instead of a frozen preservative-laced blandwheel. Santander wrote: Organic wood-fired Sicilian-style pizza (imported) from Trader Joe's = good frozen pizza. You may need to redistribute the roasted red pepper pieces and apply the included surprisingly-nice olive oil, but it actually tastes like real bread, cheese, tomato, and vegetables instead of a frozen preservative-laced blandwheel. We're big fans of this one as well. Sicilian pizza + a simple salad are in the dinner menu at our house once a week...we save it for days when we're feeling especially tired and/or lazy. I also like TJ's frozen Pizza Parlano and Vegetarian pizza...they're not as good as the Sicilian, and the Vegetarian needs to be liberally salted before serving, but for frozen pizzas, they're good stuff. Had the Sicilian style pizza for dinner tonight. Or just use some better words. It was crap why? Crust to hard, top too mushy? WHAT? walter wade wrote: Had the Sicilian style pizza for dinner tonight. Care to elaborate, or maybe try being constructive, or something? Also, you might need a new keyboard...the "1" key on your current one appears to be sticking. I'd agree all the TJ's pizzas are pretty good for frozen, but maybe a bit more sparsely topped than some would like.. I'm more a fan of the Parlanno than the Sicilian. I happen to dig the Archer Farms frozen pizzas from Target. Decent taste and affordable price. Last edited by KajmacJohnson on March 20th, 2012, 4:24 pm, edited 2 times in total. It needed a sprinkling of sea salt, but other than that, it hit the spot. at Fresh Farms they had a Home Run Inn "Signature Sausage Fireball"
I'm surprised they brought this dude to market. The heat is Wivottvian. Shocking for a frozen pizza. Yes, it advertised red and green jalepenos. But I guess I didn't believe them. Lesson learned. Hi- This seems like the best place to post this. Home Run Inn is having a dock sale at their corporate center in Woodridge on Friday 12/14 from 12:00PM-3:00PM, and if you bring in a minimum of 10 food items for donation, you get a free case of frozen thrift pizza valued at up to $45. You can also purchase a case of frozen pizza, and all the money will go to the West suburban food pantry. Please bring cash. They will not accept credit cards. Approved food donations include hearty canned soup, canned chicken, and peanut butter. Here is the link for further information. I wish I lived near there. Last edited by NFriday on December 14th, 2012, 10:39 am, edited 1 time in total. Home Run Inn seems to have been experimenting for the past year or so, so they may have decided not to continue with them but their full size Thin Crust margherita and Thin Crust uncured pepperoni are really very good. And their standby Classic Crust cheese makes an excellent base for adding your own extras to. Classic Crust pepperoni is pretty good too. Hi- This is to remind people about the charity dock sale at Home Run Inn in Woodridge from 12:00pm-3:00pm today 12/14. If you bring 10 preapproved food items for donation, you will get a free case of thrift pizza. They are requesting that you bring hearty canned soup, canned chicken or peanut butter. If you want to purchase additional cases, all the money will go to the West suburban food pantry. See the link up thread for details. There are locations in North Aurora and Carpentersville as well. My opinion, Infusino's and Emil's, both sold at Woodman's, are pretty tasty by frozen pizza standards. Orv's calls their single portion pizzas "Party for One" which has to be the most incredibly sad name for a food product in all of human history. Woodmans in Kenosha also carries Vito and Nicks frozen pizza which is a fav of mine when it comes to frozen pizza. I know the Uno's frozen is vile... How's the Gino's East? GFS sells it, among other places. KajmacJohnson wrote: I happen to dig the Archer Farms frozen pizzas from Target. Decent taste and affordable price. Ram4 wrote: Really? I didn't like the frozen Gino's East thin. I like their frozen deep dish when I don't feel like getting the real thing. Just ate part of a frozen Gino's East Deep Dish ("Sausage Patty"). At $5 (GFS) to $5.49 (Mariano's) at local stores for a 32-oz pie, that's a darn good deal, considering how that same pie is probably closer to $15 in-store or delivered. But how does it taste? Better than your average frozen, certainly loads better than Uno's Grille's restaurant version, but not up to a fresh-delivered Malnati's pie. I haven't had a Gino's East in the restaurant for many years, so it's hard to compare there. It's a bit of an odd bird: The pie is, well, pie-shaped: Sloped sides with a crust just a smidge taller than the fillings. It got a nice crunch in my convection oven, but is missing some of the cornmeal mouthfeel and taste I'm accustomed to in Chicago pan style. The sauce is smooth, and a bit on the sweet side - perhaps somewhat tomato-paste-like. The spiciness is good, it's got more garlic than a typical frozen pizza. The sausage "patty" did not match my memory of Gino's East, but I can't put my finger on it. Too thin? Probably not. Too soft? I think that might be it: The sausage is pretty fine-ground; a courser grind might make the difference. I'd definitely buy one again. As it is, I've got a lunch or two left over -- it's bachelor night, and SueF prefers pepperoni to Italian Sausage, so it's mine, all mine! The price is certainly right, and it's quite enjoyable. I had one of those a few weeks ago and was surprised at how good it was. I was prepared for another episode of "Why did I buy this",based on the memory of an Uno's frozen pizza from Jewel that I purchased some years ago. Gordon Food Service? I thought they were only wholesale, something new everyday. Hi- GFS opened up a location last year on Oakton and McCormick in Evanston, across from Aldi's. maxpower wrote: Woodmans in Kenosha also carries Vito and Nicks frozen pizza which is a fav of mine when it comes to frozen pizza. They started carrying these at Happy Foods in downtown Edgebrook. Great frozen pizza exists, and I have two slices in my freezer as I type. Recently went to Burt's, took two slices home, packed them individually and put them in the freezer. <hand flourish> Great Frozen Pizza! Aldi has these goat cheese and spinach pizzas that are pretty good. Like the TJ's pizza, you need to add a little salt as the sauce is under seasoned. Not the greatest but for some reason I really enjoy those Reggio's Butter Crust Pizzas from Aldi too. However the only one I like is the sausage one. I have tried the relatively new Home Run Inn Ultra Thin Crust Sausage available at my local Centrella. It is thinner than the regular, and when doctored with added onions, mushrooms, etc., and cooked crispy will not hurt you. High praise indeed. Whole foods had Eastside Cafe frozen pizza on sale around super bowl time. Normal price is $7.99, they had 2 for $8 during the sale. We stocked up on the supreme, which has green peppers, onion and sausage. Crust is thin and pretty crispy and there is a good amount of tasty cheese. We like the Home Run Inn ultra thin crust, but this is better and it was quite the deal when on sale. Resurrecting this thread. Maybe it was the cold weather clouding my judgment but I picked up Palermo Pizza's new "Screaming Sicilian" pizza the other night. Pretty good and I'd do it again. I'll chime in on the Screamin' Sicilian. I thought it was pretty good as well. It's my new go to when I need a frozen pizza.